Lovely, Quiet East Side Condo with 2 Great Pools! Great location and condo for active tenants who want to be near swimming, biking and hiking opportunities, or those who want a quiet location where they can watch the mountains change color during the day. RECENTLY PAINTED, NEW CARPET, and FLOORING. I just wanted to touch base with you and thank you again for the use of your condominium. It was everything we had expected and more! The place was wonderful and I couldn't help but look at the pictures of what I'm assuming to be you and your family; you definitely look like you've traveled quite extensively, how fun!! We followed all your instructions for closing up the place, everything we used we washed as well, and we replenished everything that we used along with leaving some extra stuff for the next renters. The experience for my boyfriend and I went so well, we hope to be able to do business with you again in the future. It was so nice being able to stay at a place on the eastside of town so close to my family. Thank you again, and I look forward to talking to you again. Hi Bruce! Your condo must be magic.I liked it so much that I bought one for myself. We just arrived home from Tucson. We left Thursday morning, November 20th. Thank you for sharing your condo. We did turn off the water and put the keys back in the lockbox. We left the electrical on because there is stuff in the fridge. Your location if perfect and the hot tub and pool were delightful. The condo is ready for your next tenant. I just got back in Flag. I did all you asked to close the condo. Thanks for everything; the place was ideal. We enjoyed our stay in Arizona very much and think that Summertree is a wonderfully designed complex; the area is pristine, quiet, and well looked after, airy and expansive. We were able to navigate our way around nicely and while the temperature was lower than we were expecting we managed to enjoy ourselves and learned a lot about Arizona and her history. As absentee landlords go, incidentally, you were great! The condo was a great place for us to base our activities while visiting our son at the U of A. Your unit was very functional, with a well-equipped kitchen. Overall, a very attractive complex, nice pool and spa. In addition to the Parent Weekend activities, we fit in a scenic drive up to Mt. Lemmon, and a trip down to the mission at Tumacacori and the shops of Tubac. This has been a great vacation. We enjoyed staying in your condo! use it again on our next trip to Tucson. It was very nice working with you. We are having a great time and are enjoying our home away from home. And we don't mind missing the snow back east! Will follow your directions. Thank you, again. The Cs. I am an attorney who works for the federal government in North Carolina. I'm a very active person but need peace and quiet. I am also a swimmer and was drawn to the development because I can swim laps in either pool. I'm also an avid biker and literally hardly use my rental car as I can bike to the grocery store, gym, and to the trail head. I've been fortunate to have great tenants. I know my place is less costlier than others - I'm not in the business to make a lot of money but its important to me to have happy tenants. I love Tucson! I love the mountains and the desert and the condo is close to the seguaro park east as well as sabino canyon. Tucson has a laid back quality, good restaurants, and great places for day trips. Provided by homeowner's association . Password and instructions are inside the condo. Quiet, lovely views from balcony, steps from large swimming pool. Second pool on premises. Past renters have bought condos in development. 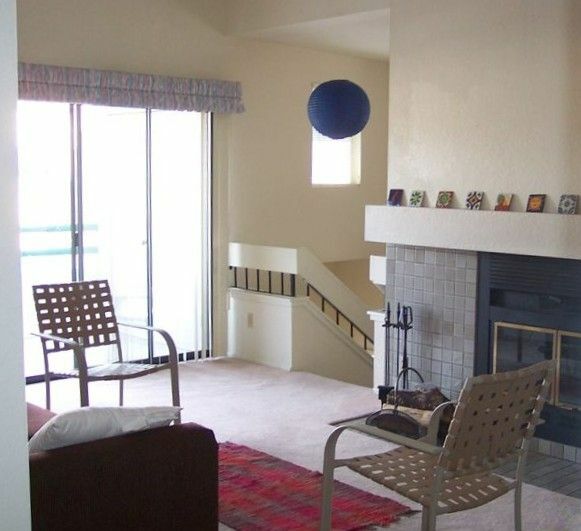 The condo is warmly decorated and very comfortable. The complex has two great pools and jacuzzis, and the environment is very peaceful. The condo’s washer/dryer was a great asset. The location is close to groceries and other services, and a wide range of restaurants. Easy drive to both Sabino Canyon and Sagauro National Park East, and to the start of the gorgeous drive to Mt.Lemmon. There were issues that the owner needs to remedy - broken blinds and a slow draining bathroom sink, for example, and a malfunctioning stove - which is being replaced, but meant a disruption in cooking plans for us. The owner is responsive and I’m sure will make things right for the next tenants. We enjoyed the condo! The area and location worked great for us! Thank you for being great guests. Mountain views from the balcony, a spacious one bedroom condo that is casual, comfortable, and located in a nice part of Tucson. Great location for us and very quiet. We loved the balcony view of the mountains. Bruce responded to our emails in a timely manner. It perfectly met our needs. The condo was very handy to shopping & restaurants and provided easy access to the attractions we wanted to visit. Having the pool & jacuzzi so close was also a big plus. This condo was a disappointment. We spent the first week cleaning. Bought new towels and linens as the ones supplied were awful. Bed was terrible. You share the closet and cabinet space with owners personal items which was weird. Vacuum supplied about ready to die. The condo development, people and location were great. We found alternate accommodations and left early. We made owner aware of conditions with no reply. There was a book in the unit with previous guest comments filled with our same complaints so this unit apparently has been this way for years. I'm sorry to hear that you were disappointed with the condo and your stay there. I'd like to respond first by saying the bed and vacuum are both less than a year old....literally brand new. We ask each guest to clean the condo before they leave and price accordingly, no cleaning fee, a feature you reaped the benefit of. The price point is incredibly low for an entire condo with a heated pool at your front door. . About $55 per day to be exact. Perhaps a hotel with maid service and no kitchen ( so you can eat out every meal! ) would be a better choice for you. The cost would only be about double for that area. As for the book, the condo re rents to return tenants every year who love it, as do we, the owners who have every right to store our things there. According to VRBO our average response time is less than an hour, so to say we didn't respond to you would simply be untrue, We also offered to reimburse you for the linens, which you declined! Good luck to you.